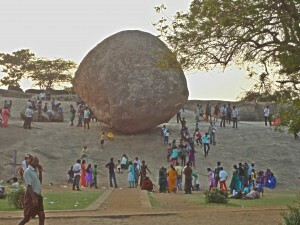 Mammalipuram (formerly called Mahabalipuram) is a small coastal town about 60km south of Chennai. 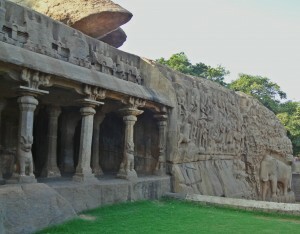 It is famous for its Pallava Dynasty (7th – 8th century) monolithic, rock-cut temples and shrines. They really are quite amazing with fine relief sculptures carved out of the granite. There is a small hill on one side of the town with many of these cave shrines and close to the shore is a group of five called the Panch Rathas. 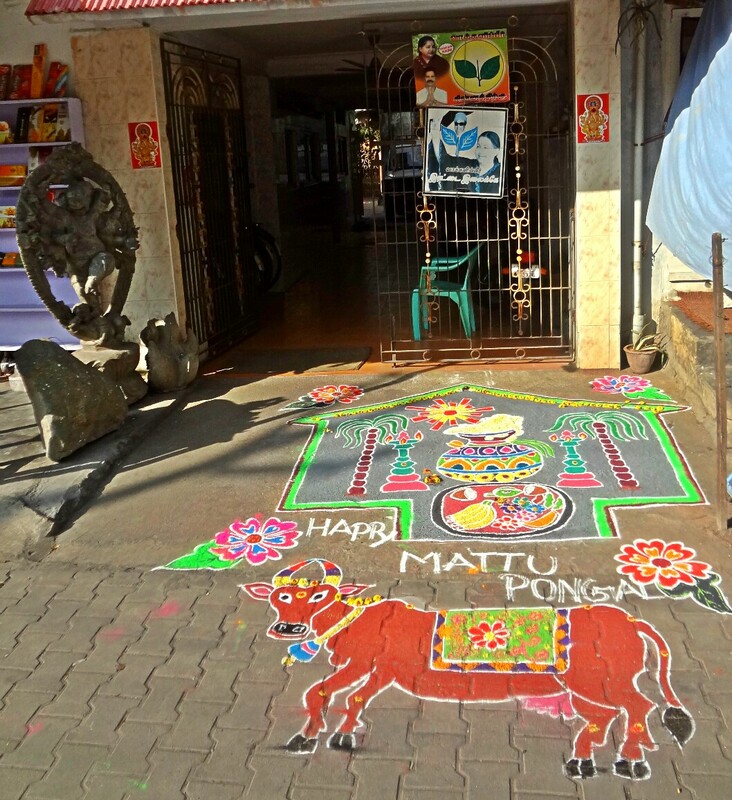 The Pongal festival which lasts for 4 days was still on when we were there and as in Kanchipuram, there were elaborate sand paintings outside the doorways. 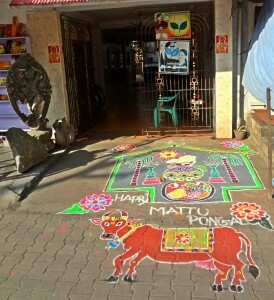 Many day-trippers from the surrounding villages had come into the town to picnic and celebrate as Pongal is a holiday. The town was teeming with people and it was a challenge to see inside the smaller shrines as everyone seemed to want to take family photographs with various combinations of family members in front of the most interesting sculptures. After a while of patient waiting, we gave up and just enjoyed watching the people. 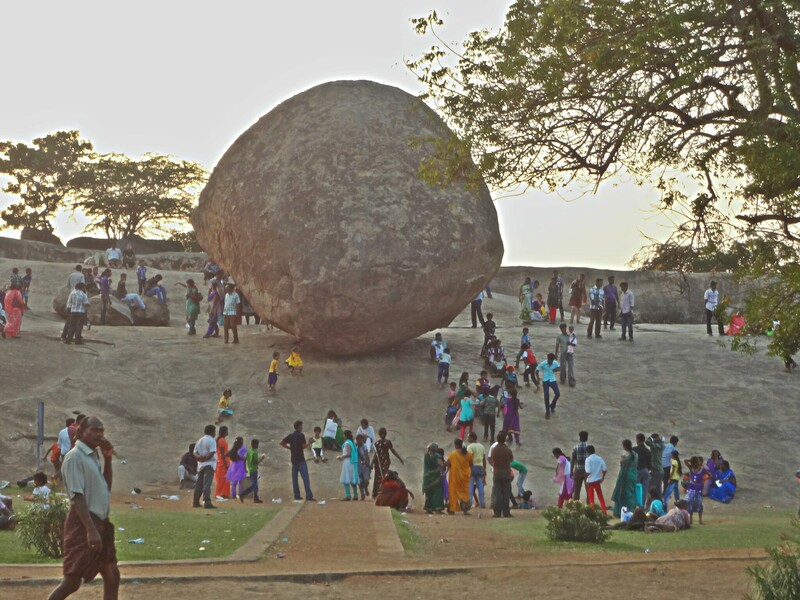 There is a giant boulder on the hill called Krishna’s Butter Ball (the deity Krishna was playful and liked to steal butter!). It is about 5 metres wide and is delicately balanced on a smooth surface, apparently defying the laws of physics. Of course, many wanted to be photographed appearing to hold the boulder in their palm and it was quite funny watching these whacky photos being taken. 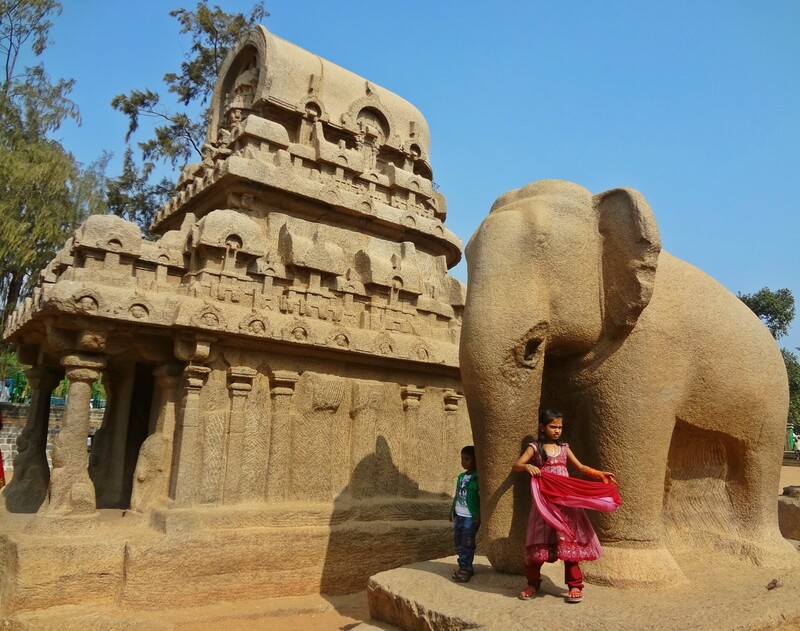 We were lucky to be in Mammalipuram during a classical Indian dance festival. 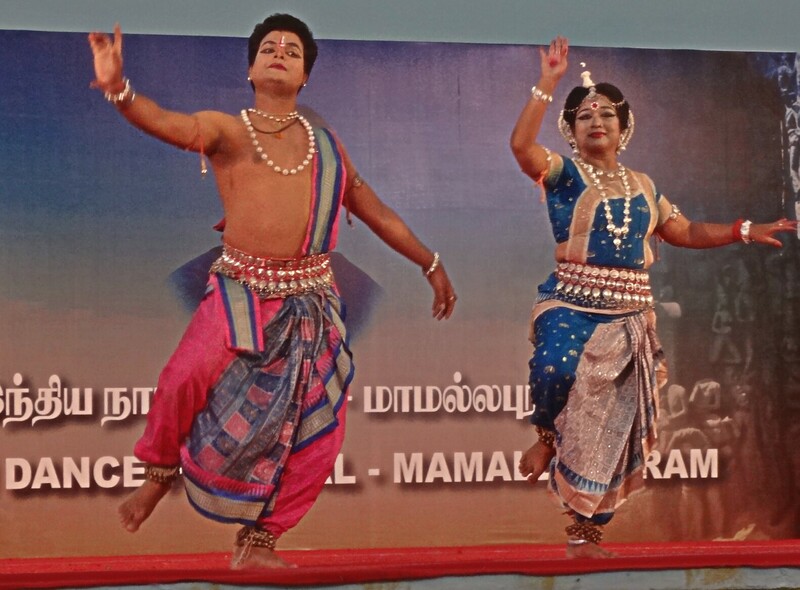 Performances were held every evening outside the Shore Temple and since they were free, we took advantage of that and went every evening we were there. 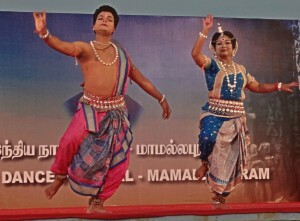 Most of the performances were Bharatnatyam which we love to watch. The dancers performed with live musicians and their movements and facial expressions were spell-binding. The day we left Mammalipuram, bikers on all types of motorbikes were riding into the town from all directions. There was some sort of a biker’s festival scheduled for that day. Though it might have been interesting to watch, the noise on the narrow streets was deafening. A good time to leave!